Basement rocks of the Midland Valley Terrane in Northern Ireland comprise the Proterozoic Central Inlier and early Palaeozoic Tyrone Igneous Complex . Both geological units are bounded by faults (P947794) and have very different geological origins. At its southern margin, the Tyrone Igneous Complex is overlain unconformably by late Ordovician and early Silurian sediments of the Pomeroy Inlier . Further west, the fault-bounded Lisbellaw Inlier consists of early Silurian sedimentary rocks . The Corvanaghan Formation of the Central Inlier  is lithologically, structurally and metamorphically distinct from the Tyrone Igneous Complex. It is tentatively assigned to the Moine Supergroup and is possibly an exhumed slice of the Central Highlands (Grampian) Terrane (see Central Highlands (Grampian) Terrane - metamorphic basement article). The Tyrone Igneous Complex is broadly divided into two parts. The basal Tyrone Plutonic Group comprises basic igneous rocks including gabbro, dolerite and basalt. Their field relationships reflect a complex thermal and tectonic history and they are believed to represent a portion of an early Ordovician ophiolite (oceanic crust) . 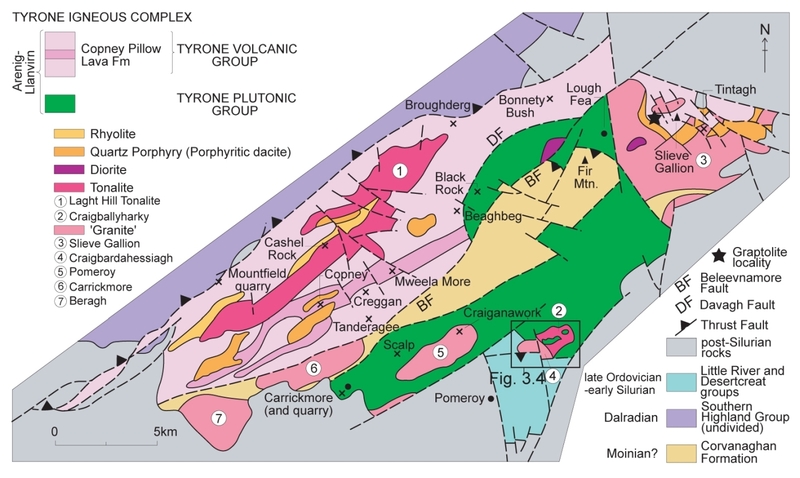 The Tyrone Volcanic Group forms the upper part of the Tyrone Igneous Complex and consists of basic to intermediate pillow lavas and volcaniclastic tuffs, rhyolites, banded chert, jasper and argillaceous sediment. The sequence is interpreted as being deposited in a volcanic arc setting. Graptolites from the Tyrone Volcanic Group give an Arenig-Llanvirn age . The Tyrone Igneous Complex and Central Inlier are intruded by volcanic arc-related plutonic and higher level granitoid intrusions. Zircon dating (U/Pb) indicates that their intrusion occurred at 470–465Ma (mid-Arenig to early Llanvirn), soon after the formation of the ophiolite and volcanic arc sequence and provides a minimum age for the Tyrone Plutonic Group. The Tyrone Igneous Complex is one of an association of complexes in Great Britain and Ireland that have oceanic affinities. They all contain sections of ophiolite, as well as examples of volcanic arc, accretionary prism and fore-arc basin deposits. However, the Tyrone Igneous Complex is one of the largest and most varied in that it includes part of an ophiolite, a volcanic arc sequence, arc-related granitoids and a portion of continental crust. The Tyrone Igneous Complex is thus closely related to the Highland Border Complex and the Ballantrae Igneous Complex of Scotland and to the Clew Bay Complex of western Ireland, in that they all fall along or are located to the southeast of the Highland Boundary Fault-Fair Head-Clew Bay Line . ↑ 1.0 1.1 Geological Survey of Northern Ireland 1979. Pomeroy, Northern Ireland Sheet 34. Solid Geology. 1:50 000. (Southampton: Ordnance Survey for the Geological Survey of Northern Ireland). ↑ Bluck, B J, Gibbons, W, and Ingham, J K. 1992. Terranes. In: Cope, J C W, Ingham, J K, and Rawson, P F (eds.). Atlas of Palaeogeography and Lithofacies. Geological Society of London, Memoirs, 13, 1-4. ↑ Max, M D, and Long, C B. 1985. Pre-Caledonian basement in Ireland and its cover relationships. Geological Journal. 20, 341–66. ↑ Hartley, J J. 1933. The geology of North-Eastern Tyrone and adjacent portions of Co. Londonderry. Proceedings of the Royal Irish Academy, B41, 218–85. ↑ Hutton, D H W, and Holland, C H. 1992. An Arenig-Llanvirn age for the black shales of Slieve Gallion, County Tyrone. Irish Journal of Earth Sciences, 11, 187–89. ↑ Geological History of Britain and Ireland. Woodcock, N H, and Strachan, R (eds.). 2000. Blackwell Science Ltd.